"THE SENSES, BEING EXPLORERS OF OUR WORLD, OPEN THE WAY TO KNOWLEDGE." This is the page to come to for the yearbook! Currently, last year's is still available to order. We will be adding the 2018-2019 yearbook at the end of the academic school year. If you are taking photos at events and would like to submit them to be considered for this year's yearbook, please submit them by clicking below. SUBMIT 2018-2019 PHOTOS FOR YEARBOOK! PRESENTING THE 2017-2018 SCHOOL YEARBOOK! The yearbook is now available to order online! Hardcover and over 50 pages, the photos will last through the ages! BONUS: You can personalize your book! 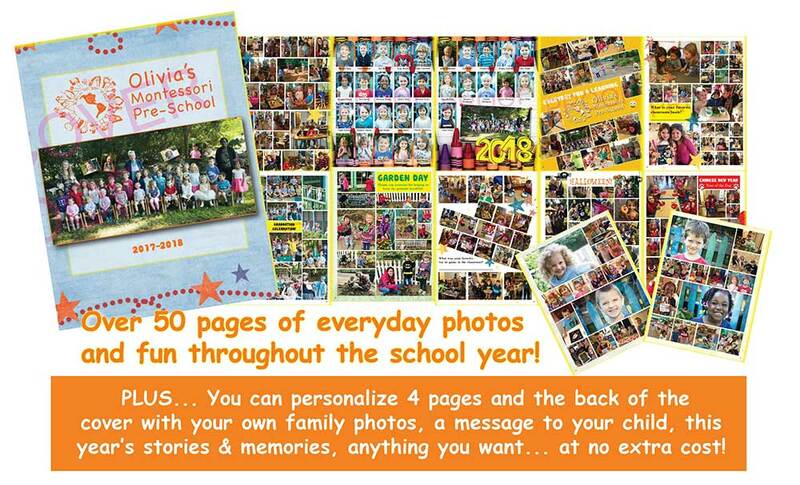 4 pages are devoted for you to add your own family photos, memories, stories or anything you want to remember in the years to come! CLICK HERE TO ORDER YOUR YEARBOOK AND START PERSONALIZING!